UPDATE: Sonos wireless iPod dock on sale from today | What Hi-Fi? Used with a Sonos system, it allows content from the Apple personal players to be streamed to any room with a Sonos client unit. It will also charge the devices while docked. On the way from Sonos is the £99 WD100 Wireless Dock for iPods and iPhones, allowing music stored on the portable devices to be streamed to any room in the house with a Sonos unit. 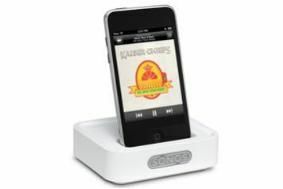 The WD100 accesses music digitally from iPods and iPhones, and sends it wirelessly to the company's ZonePlayers for digital to analogue conversion and playback. It's compatible with 1st, 2nd and 3rd-gen iPod Touch, iPod Classic, iPod nano (3rd-5th gen), and iPhones, and will be in the shops at the end of October.